The piece is an extension of the early work series Public Educational Tours (1999-2001) which consists in guided bus-tours that bring out new perspectives on a number of European cities. Through the insertion of fictitious elements into their historical narratives, these tours shed light on what has been excluded from the official record and thus adjust the identity of the place in question. Atomic Tour - City of the Damned maps and interprets the origins and advancement of right wing populism in Norway since the 1930’s. The story traces the origin and development of the Progress Party, while relating the narrative about the Atomic Virus, about incidents involving radio active sand and about bizarre occurrences, presumably originating from an extra-terrestrial source. 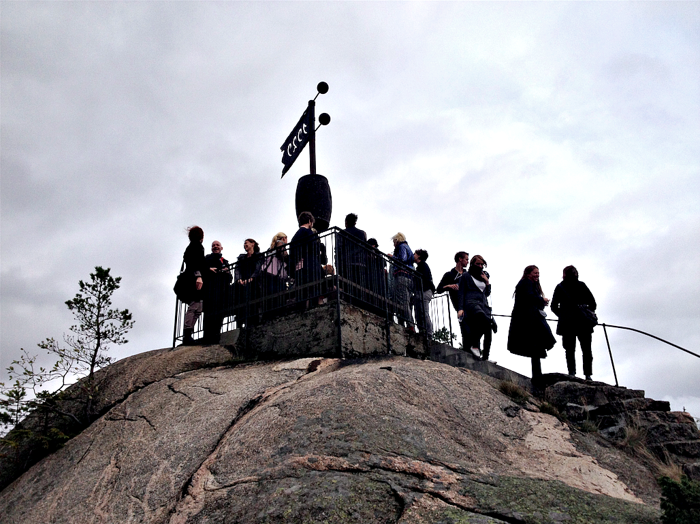 The tour takes it’s passengers around a number of viewpoint situated around Kristiansand, viewing the city from above, allowing for contemplation, photo opportunities and refreshments. Atomic Tour was produced for the exhibition The Beginning is Always Today - Contemporary Feminist Art In Scandinavia at SKMU (Sørlandets Kunstmuseum) and was subsequently included in the museums collections. Lotta Antonsson, Elisabet Apelmo, Pia Arke, Bob Smith, Catti Brandelius, Peter Brandt, Nanna Debois Buhl, Kajsa Dahlberg, Ewa Einhorn, Åsa Elzén, Unn Fahlstrøm, Roxy Farhat, Fine Art Union, FRANK, Unni Gjertsen, Trine Mee Sook Gleerup, Jenny Grönvall, Annika von Hausswolff, High Heel Sisters, Leif Holmstrand, Maryam Jafri, Dorte Jelstrup, Jesper Just, Jane Jin Kaisen, Line Skywalker Karlström, Kvinder på Værtshus, Ane Lan (alias Eivind Reierstad), Lotte Konow Lund, Jannicke Låker, Malmö Fria Kvinnouniversitet (MFK), Eline Mugaas, Ellen Nyman, Radikal pedagogik, Lilibeth Cuenca Rasmussen, Annica Karlsson Rixon , Joanna Rytel, Katya Sander, Mari Slaattelid, Lisa Strömbeck, Vibeke Tandberg, Lisa Vipola, YES! Association / Föreningen JA!